I think that one of the most fun parts of Christmas is singing all of the festive songs. There are so many Christmas songs for kids and we only get the chance to sing them for about one month a year, so we definitely like to make the most of it! I thought that a fun way to teach the kids some new songs and have fun singing together would be to make a Christmas song basket, so here it is! Ethan and I set up the basket together, finding everything that we needed from all around the house. We looked through all of their Christmas toys, on the Christmas tree and boxes of decorations, in our instruments box and just in the toy box. Then Ethan and Ivy took turns choosing one of the Christmas props out of the basket and they could each choose an instrument to play to go along with it. Ethan has also been singing some songs at preschool for his Christmas concert, so he was able to teach me some songs as well! I loved when he sang Christmas Pudding and did the actions and taught them to us. We sang all the classics like Rudolph the Red Nosed Reindeer, Santa Claus is Coming to Town and Jingle Bells. The kids absolutely loved it and had so much fun singing the songs and playing instruments. I lead them in the activity to begin with and then they were so involved that they happily continued on without me, which I love! 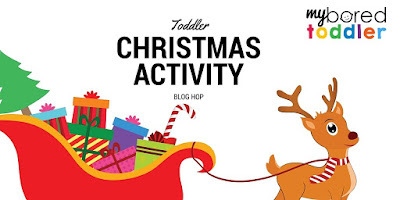 This post is part of a Toddler Christmas Activity Blog Hop hosted by My Bored Toddler. For more fun ideas for little ones to keep them busy this Christmas take a look!